World number six and 2016 French Open champion Garbine Muguruza’s quest for her maiden quarterfinal berth at the Miami Open came to abrupt end today. Subsequent to dropping the first set in a tiebreaker where she posted only one point, moreover on her opponent’s serve, the Spaniard summoned the trainer on court. Soon there was a handshake with Caroline Wozniacki and the match was over. The umpire announced that Muguruza abandoned play due to illness. Muguruza scrapped by in her previous two matches. In her second round opener, Christina McHale was up 6-0, with a break in the second set as well as match point before the Spaniard rescued the win 0-6,7-6,6-4. The next round, Muguruza surrendered the first set against Shuai Zhang then regrouped to march to victory 4-6,6-2,6-2. Wozniacki and Muguruza had collided on four prior occasions including in Miami in 2013. The Spaniard last defeated her rival at Wimbledon in 2015 in straight set en route to her maiden major final. The proceedings began with exchanges of breaks. Wozniacki obtained the upper hand with a forehand return winner to get to 3-1. Then, she consolidated for a 4-1 lead. Muguruza utilized her coaching call at that point in the set which seemed effective. When she came out, she held serve and pocketed a marathon seventh game to get back on serve. Later on, with a forehand crosscourt winner, Muguruza turned the set in her favor by securing the break to go up 5-4. The Spaniard’s advantage was short-lived. Serving for the set, Muguruza was unable to keep her error count down and her streak of four consecutive games was halted. Still, the world number 6 continued to fight, overcoming a double fault gave Wozniacki break point at 5-6 to push the set into the tiebreaker. After the match, Muguruza felt “disappointed that I could not continue after fighting so hard to get to this stage. It bothers me. [Especially} since I was playing at a good level”. She cited that when she woke up that she had a good practice suddenly around the third game she “started feeling headache, stomach pain. . . later on dizziness” which persisted the rest of the set. This type of heat related effect is not new to the Spaniard, she says that she experienced something similar at the U.S. Open last year and at the Australian Open this year. Perhaps, according to Muguruza “tension played a factor as well”. Would Muguruza have decided to persevere had she closed out the first set at 5-4? She replied “I was not feeling well at that point, I’m not sure, win or loose, I was thinking more about my health”. What’s up next for the French Open titlist “I will rest. I think my body is asking me to do that. I’ve been struggling with an ankle problem all season”. Wozniacki will meet Lucie Safarova, the 2015 French Open Finalist, who has been regaining her form after being sidelined by illness for several months following her deepest run at a major. Saforova upset fourth seed Dominika Cibulkova, 7-6, 6-1 to punch her ticket into the quarters for the first time at Miami Open. In the first match on stadium court, Karolina Pliskova handled Barbora Strycova 6-1, 6-4 to secure her space in the quarterfinals. The second seed will clash with either Mirjana Lucic-Baroni or wildcard Bethanie Mattek- Sands who are both trying to reach the last eight for the first time in South Florida. 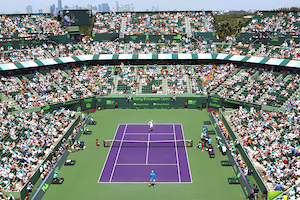 First on Stadium Saturday at the Miami Open, Stanislas Wawrinka takes on Horacio Zeballos. The world number three holds a 2-0 record against Zeballos who had his best results at this event last year as a lucky loser. After Roger Federer pulled out due to illness, he shocked both Juan Martin Del Potro and Fernando Verdasco to advance to the round of 16 before being stopped by David Goffin. Consequently, with the Argentinian fans behind him and fond memories, Zeballos could present a challenge for the men’s top seed. Later on in the afternoon, Wawrinka’s compatriot Federer begins his quest for the coveted Indian Wells, Miami Open double trophy, something he has not accomplished in over a decade. The 35 year old, 18 time major champion faces American rising star, 19 year old Frances Tiafoe. This will be their first meeting. The dynamic should be interesting dynamic considering the venue and the disparity in their resume. On the women’s side, after her narrow escape in three sets on Friday, needing a rain delay and saving a match point against Christina McHale, Spain’s Garbine Murguruza returns for her third round match against China’s Shuia Zhang. The two met for the first time in Doha this year in the round of 16 with Zhang pulling off the upset. Thus, Murguruza will hungry for payback. Another compelling day session match is Agnieszka Radwanska versus Mirjana Lucic- Baroni. The Croatian stunned 2012 Miami Open Champion in the second round this year at the Australian Open on route to her semifinal berth for the first time at a major since Wimbledon 1999. So, revenge will be on the agenda for the Pole without question. Second seed Karolina Pliskova and fifth seed Dominika Cibulkova also are back on court for their third round matches as well as 2015 French Open finalist Lucie Safarova. The honor of closing out the night on the men’s side belongs to Juan Martin Del Potro as he tussles with Robin Haase. With a 2-0 record over the Dutch and with the South American crowd likely to be in full force, Del Potro will likely book a projected date with Federer for the third round. For the ladies, Sorona Cirstea battles Caroline Wozniacki to end the evening. It will be a riveting contest considering their close head to head of 4-3 with the former world number one having the edge. Click here for Saturday’s complete order of play. Serena Williams beat Maria Sharapova 6-4, 6-3 on Thursday to reach the Sony Open final. For the 17-time major winner, it was her 15th straight win over the Russian improving her record overall to 16-2. The American had to rally from deficits in each set during her semifinal match – 1-4 in the first set and 0-2 in the second. “I started off really well, and I was up in a lot of the games and didn’t win them today.” Sharapova said. “The first set started off really well and I had more break points. She served her way out of trouble on those in the first set, and then the second set was up 2‑0, 40‑15, which was a game I should have taken, pretty important game. “I have always felt when I’m playing at my best, then it’s hard for people to beat me,” Williams said. “But I have to get there, and it’s hard to always be at your best, obviously. “Despite my results against her, I still look forward to playing against her because you learn so much from that type of level which she produces,” Sharapova explained. No. 1 Williams will face No. 2 Li Na in the final on Saturday. In a rematch of the Australian Open final Li beat Dominka Cibulkova 7-5, 2-6, 6-3. rebounding from a 1-3 deficit in the final set. For Li it will be her first Miami final. Williams will be attempting to defend her title and win a record seventh Sony Open crown. Williams has a 10-1 record against Li. It will be a rematch of the Australian Open women’s final in the semifinal of the Sony Open as both Li Na and Dominika Cibulkova advanced on Wednesday. Li won the Australian Open in straight sets for her second major title. No. 10 seed Dominika Cibulkova saved three match points in the second set en route to a 3-6, 7-6 (5), 6-3 victory over Agnieszka Radwanska, No. 2 Li Na won the last 4 straight games to close out Caroline Wozniacki 7-5, 7-5. Cibulkova won despite poor serving and unforced errors. She had her serve broken 10 times and double-faulted 8 times, committing 51 unforced errors. One of her match points saved came on a controversial call which was overturned due a challenge. He match against Radwanska was a repeat of the Australian Open semifinal where the Slovak won over the Pole to make her first major final. The Slovak who is in the Sony Open semis for the first time, will enter the top ten for the first time when the rankings come out on Monday. “I’m really glad, especially about my win today,” Cibulkova said. “It wasn’t easy at all to play today against Aga with the wind and conditions, and I had to stay aggressive all the time even if I missed many shots, you know. I just had to keep going. “So today the match was really tough, and I’m happy about everything, you know. Before the match, even before the tournament, like they keep asking me, Top 10 and everything, and I just, you know, I just said, like, Okay, if I should be there, I will be there. If I should not be there, I will not be there. “I think it was so close, the second set,” Radwanska said. “But I think, you know, in those matches you have to play good and you have to be lucky. With Li Na’s win, she become the first Chinese player to reach the Sony Open semifinals. “I think today I was feeling she was the best to defend in all the tour, so I was feeling a little bit like player against a wall,” Li said about her match against Wozniacki. “Because doesn’t matter where is it. She always come and put the ball back to my court. On Thursday six–time Sony Open winner No. 1 Serena Williams will take on five-time finalist and No. 4 seed Maria Sharapova in the first women’s semifinal. Williams holds a 15-2 record against the Russian, winning the last 14 straight matches dating back to 2004. In a tale of two different matches, expected results as No. 1 Serena Williams and fourth seed Maria Sharapova reached the quarterfinals of the Sony Open on Monday. Williams dismissed American countrywoman qualifier CoCo Vandeweghe 6-3, 6-1 to reach the elite 8 in Miami for the 13th time in 14 appearances. After her first two matches in the tournament she showed some rust, Williams cleaned up her game hitting 17 winners to only 11 unforced errors and stopping all six break points she faced. Next up for Williams will be the No. 5 seed Angelique Kerber, who beat Ekaterina Makarova 6-4, 1-6, 6-3. “It will be good to play a different opponent,” Williams said. “I feel like I have played the same person three times in a row. It will be nice to play a lefty, someone that just plays different. Maris Sharapova had to reset from a first set drubbing to beat Kirsten Flipkens 3-6, 6-4, 6-1. The Belgium jumped out to a 4-0 lead in the first set and Sharapova could only win five points during those four games. In the second set Sharapova jumped out to a 4-0 lead, then Flipkens won 4 out of 5 games, but Sharapova broke serve to take the set 6-4. Sharapova’s momentum carried over into the final set where she kept her errors low and her aggression high, dropping only one more game. Final stats for Sharapova- 36 unforced errors, 13 winners and 10 double-faults. Sharapova will play the woman she lost to in the 2011 Wimbledon finals, No. 8 seed Petra Kvitova in the quarterfinals. Kvitova regrouped to stop Ana Ivanovic 3-6, 6-0, 6-0. “We haven’t played for a long time, but we have always had interesting, tough matches against each other,” Sharapova said. Second seed Li Na took apart Carla Suarez-Navarro 6-0, 6-2. Caroline Wozniacki continued her dominance over US players. For the second match in a row she gives up only 1 game in a 6-0, 6-1 win over Vavara Lepchenko. In the night session, Dominika Cibulkova held back a fighting Venus Williams 6-1, 5-7, 6-3 to reach the quarterfinals. In a rematch of the recent Australian Open semi Cibulkova will play Agniezska Radwanska. Last June in the round of 16 at Wimbledon, Marion Bartoli stared down Serena Williams for her initial victory over the defending champion. Despite Williams’ twelve month absence from competition and only her second tournament back, Bartoli’s triumph was classified as a major upset. Whether one calls it revenge or redemption, Williams was looking to make a statement in the final against Bartoli. After a tough first set, Williams vanquished Bartoli 7-5,6-1 at the Bank of the West Classic to claim her premier title since 2010 Wimbledon. Due to Dominika Cibulkova withdrawing from their semifinal match because of an abdominal strain, Bartoli had an extra day of rest. Yet, unlike Wimbledon, fitness has not been an issue for Williams this week. A noticeably more in shape Williams required just 69 minutes to dismiss 2011 Wimbledon finalist Maria Sharapova in the quarterfinals. The following night in the semifinals, Williams dispatched 2011 Wimbledon semifinalist Sabine Lisicki in 59 minutes. However, knowing that she won their ultimate meeting gave Bartoli a lot of confidence. Early on, the 2009 Bank of the West Classic champion gave Williams plenty to ponder. A definite truism which applies to Serena Williams is that she’s always hungry for another major. The two time defending champion demonstrated that despite some first week cobwebs, she is prepared to fight for a “three-peat” at the All England Club. Venus Williams, a five time champion at Wimbledon, is still in contention for another title on her most successful surface. Maria Sharapova, the 2004 champion, is almost playing to the standards expected of her. Sharapova is trying to get pass the fourth round for the first time since 2006 at this venue. The most stunning early departure was 2010 runner-up Vera Zvonareva. Here’s a mid-tournament summary and a preview of the interesting match-ups to come. 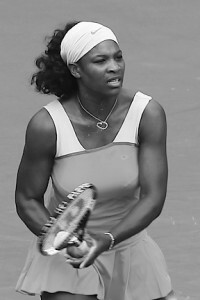 After going the distance her first two rounds, Serena Williams cruised in the third round against Maria Kirilenko. The next round, Serena will have to bring her best stuff against Marion Bartoli, the 2007 Wimbledon finalist. Bartoli is playing with great confidence since winning her maiden grass court title in Eastbourne. Subsequent to a comfortable opening match, Venus Williams clawed past 40 year old Kimiko Date-Krumm in the second round. However, in the third round, Venus coasted to victory. Next up for Venus is Tsvestana Pironkova. In a rematch of last year’s semifinal, Pironkova avenged her lost to Zvonareva in the third round. In 2010, Pironkova reached the semifinals by upending Venus in the quarterfinals. Pironkova also ousted Venus at the Australian Open in 2006. With Pironkova’s 2-1 against Venus, this tussle could be another doozy. Another Serena-Less “Slam”: Who Will Capitalize at the Australian Open? For the second consecutive major, Serena Williams will be a no-show. With the two time defending champion and former world number one still injured, current world number one Caroline Wozniacki should technically be “the” favorite. While Wozniacki is a certain contender for the crown Down Under, it’s difficult to position her in the number one spot. With her victories at the U.S. Open and the WTA championships to finish 2010, Kim Clijsters has to be viewed as the outright favorite. The way the Australian Open draw stacks up, Clijsters has to relish her chances. Let’s take a look how it breaks down. Imagine needing to conquer Gisela Dulko in the first round, Dominika Cibulkova in the third round and either Justine Henin or Francesca Schiavone just to get to the quarterfinals. This is the precise task which probably awaits Wozniacki. Moreover, in the semifinals, the Dane could clash with either Venus, whom she has never beaten, Victoria Azarenka or Maria Sharapova. In light of the treacherous road ahead, Wozniacki has her work cut out for her in trying to survive the first week and retain the number one ranking. Since her 2010 Wimbledon injury, this will be Henin’s first major. After months of noncompetitive play, Henin performed well at the Hopman Cup. In Melbourne, a possible third round encounter with Svetlana Kuznetsova will be her first true challenge. Last year, Henin battled her way to the final after an almost two year sabbatical. Consequently, if the Belgian successfully navigates the first week, she could duplicate her feat of a year ago. If healthy, Venus should reach the round of 16 with ease. At that stage, the 2003 Australian Open finalist could be tested, if the draw holds true to form, by the 2008 Australian Open champion, Sharapova. The Russian’s last major was in Melbourne. Subsequent to shoulder surgery a couple of years ago, Sharapova appears finally at full steam. That type of encounter could be a shot in the arm for Sharapova and push her back into the top ten.